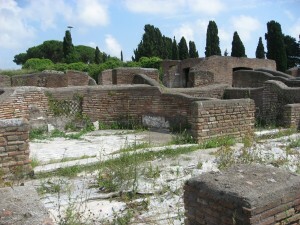 Urban landscape at ancient Ostia. Photo: Kaisa-Maria Pihlava. The goal of the research project led by prof. Antti Marjanen is to deal with four themes in the study of early Christian social history which have so far attracted less attention than they deserve: (1) the role of women who hosted first- and second-century house churches, (2) the role of and the attitude toward merchants in early Christian texts and communities, (3) Christian attitudes toward soldiers and the enlistment of the Christians in the army, and (4) the masculinity of Jesus in light of Greco-Roman and Jewish understandings of the ideal manly character. A common starting-point for the study of the four subjects is to map out the general background of the phenomena in antiquity and then assess the relevant Christian texts in light of their social-historical context. The main result of the project is three doctoral dissertations and a collected volume of articles on the themes of the project and other related social-historical topics.